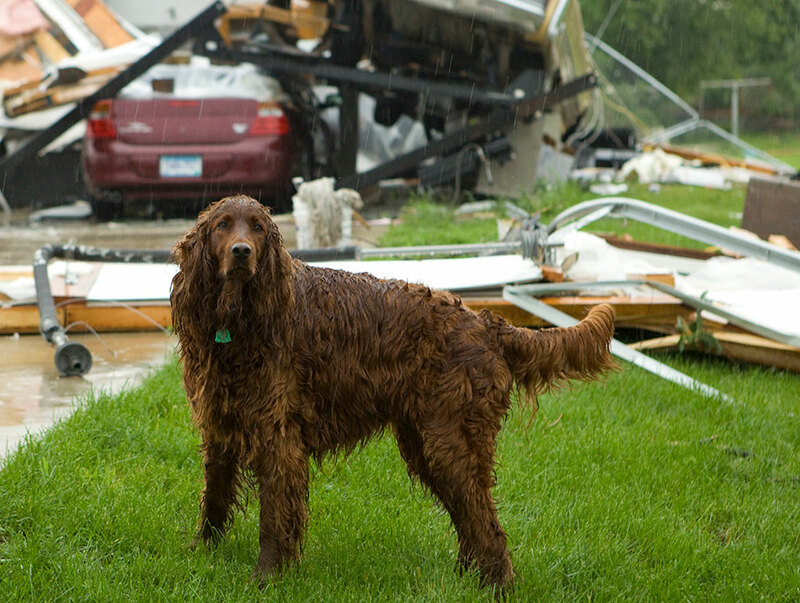 The following information, prepared by the Humane Society of the United States, will help you become better prepared to care for your pets in a disaster or emergency. Your pets should be wearing up-to-date identification at all times. In addition to your phone number, include the number of a friend or relative. If your pet is lost, you want to provide a number on the tag that will be answered when you are away from your home. Don’t wait until a disaster strikes to do your research. Evacuation shelters do not generally accept pets, except for service animals. Plan ahead to ensure your family and pets will have a safe place to stay. If you have more than one pet, you may have to prepare to board them separately. Make a list of boarding facilities and veterinary offices that might be able to shelter animals, including 24-hour telephone numbers. Ask your local animal shelter if it provides foster care or shelter for pets during an emergency. Animal shelters have limited resources so this should be your last resort. Contact hotels and motels outside of your immediate area to check policies on accepting pets. Ask about any restrictions on number of animals, size and species, as well as whether a “no pet” policy would be waived during an emergency. Make a list of pet-friendly places and keep it handy. Call ahead for a reservation as soon as you think you might have to leave your home. Check with friends, relatives or others outside of your immediate area. Ask if they would be able to shelter you and/or your animals, if necessary. The single most important thing you can do to protect your pets if you evacuate is to take them with you. If it’s not safe for you to stay in the disaster area, then it’s not safe for your pets. Animals left behind in a disaster can easily be injured, lost or killed. Animals left inside your home can escape through storm-damaged areas, such as broken windows. Animals turned loose to fend for themselves are likely to become victims of exposure, starvation, predators, contaminated food or water, or other accidents. Do not leave your animals tied or chained outside during a disaster; this can be deadly. If you leave, even if only for a few hours, take your animals. You have no way of knowing if you will be allowed back into the area to care for your pet. Leave early; don’t wait for a mandatory evacuation order. An unnecessary trip is better than waiting too long, making it unsafe to leave. Take pet food, medications and special items with you such as leashes, toys or a litter box. An evacuation order may be issued, or a disaster may strike, when you’re at work or out of the house. Make arrangements well in advance for a trusted neighbor to take your pets and meet you at a specified location. If you arrange for someone to take your pets, be sure the person is comfortable with your pets, knows where your animals are likely to be, knows where your disaster supplies are kept and has a way to access your home. If you use a pet sitting service, discuss the possibility of getting their assistance well in advance.